Taco Bell is testing the new Caesar Crunchwrap in at least one location out in Ohio, which happens to be a popular testing area for new Taco Bell items. Rather than relying on the tostada shell for crunch as in the original Crunchwrap Supreme, the Caesar Crunchwrap instead features new parmesan crisps, which were described to me by a Taco Bell employee as similar to thick potato chips in texture. In addition to the new crisps, Taco Bell's Caesar Crunchwrap also includes grilled chicken, Caesar dressing, Romaine lettuce, three-cheese blend, and tomatoes in a folded and grilled flour tortilla. The price tag for the new Crunchwrap is $2.99. A $5 Caesar Crunchwrap Box is also being sold that includes the namesake Crunchwrap, a Doritos Locos Taco, Crunchy Taco, and medium drink. I was able to verify that the new menu item is available at a Taco Bell restaurant in London, OH. Other Taco Bell locations in the area may also be carrying it on the menu. 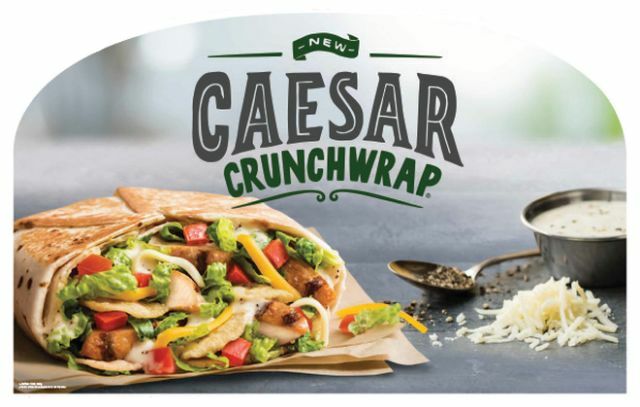 The Caesar Crunchwrap would not be the first Caesar salad-inspired item that Taco Bell has offered. Back in 2003, they briefly offered the Grilled Chicken Caesar Grilled Stuft Burrito (I remember quite liking it).